New 8 litre capacity desiccant dehumidifer ideal for car storage and moisture extraction in cold weather i.e. unheated barns, cellars, sheds and of course homes. Perfect in boats, caravans too. Upgraded in early 2013 with a new, thicker filter using Polyesthylene terephthalate fibre or PET as an anti-bacterial agent, so its perfect for unheated or cold homes as well as garages. For car storage, a 2-3 car garage is perfectly suited to it. To save power, once it has reached the set humidity level (55% is perfect) it will only restart half hourly to check the air, and switch off after 5 minutes unless it needs to work. This useful feature sets it apart from many other desiccant machines where the fan runs permanently. Supplied with permanent drain hose so you really can set it and leave it to work by running the hose outside. Do ensure there is a fall on the hose as its gravity fed. It is advised to rinse the filters every few months and allow air flow around it to maximise performance. It replaces the popular and award winning DD122FW, with quiet running modes using desiccant, and can't freeze up in really cold weather. 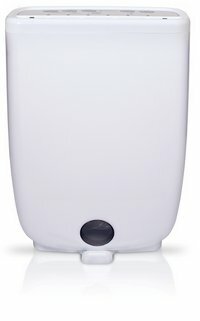 It has a slightly larger capacity, is still a desiccant dehumidifier, so it has all of the features that made the DD122FW so popular, it is just a slightly larger capacity dehumidifier for larger spaces. "Simple, well priced and efficient what more do you need from an internet seller!"